In the Illinois General Assembly, bills under consideration first go through a committee hearing. 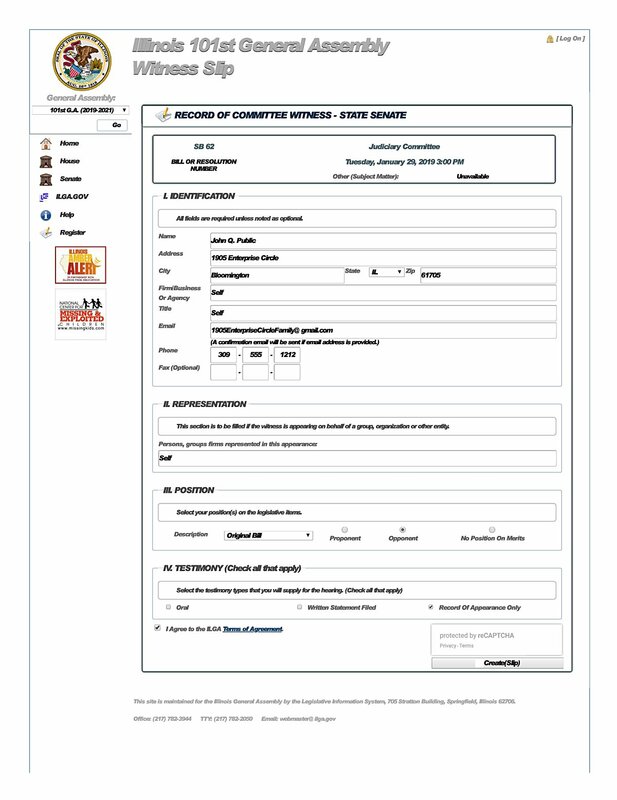 While lobbyists for gun rights groups will often enter oral testimony for or against a bill concerning firearms in these committee hearings, you too can enter your support or opposition electronically through “Witness Slips”. Frankly, our legislators can’t know everything. Where they don’t already have a strong opinion, they will look at the support and opposition a bill has generated via witness slip participation. Legislators will often vote with the side that has the greatest engagement – and that will offer them the least static. That’s right: While politicians seldom look over the list of people who have submitted witness slips pro or con, they do note numbers. Witness slip participation gives legislators an idea of how the rest of the state might feel. Remember, scarce few people are involved influencing politicians in Springfield – so when you participate, your influence gets magnified dramatically. 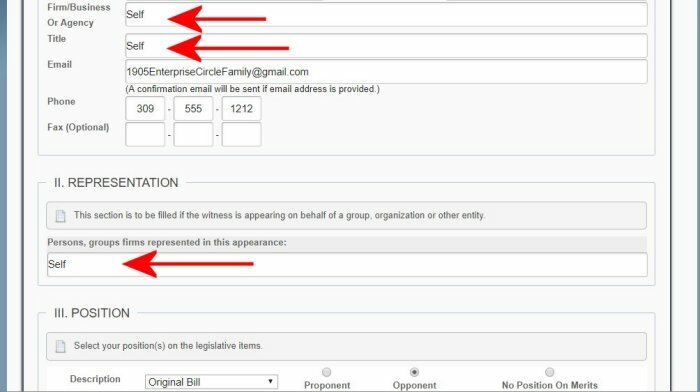 Slips can be filed for both the Illinois House and Senate committee hearings. And while you may submit slips up until the end of the day for a committee hearing in the Senate, if you want your slip to count as part of committee members’ deliberations, you should file prior to the scheduled start time of said committee. These witness slips have proven effective for our side in the past. So much so, in fact, that the other side has begun encouraging people from across the nation to file slips in support of gun control ahead of these hearings. Here’s a quick and dirty tutorial on how to file witness slips. This can be done from these magic glowing boxes everyone carries in their pockets now (smart phones), or from tablets or more traditional computers. All you need is an internet connection, an email account and about a minute or two of time once you have done it a few times. Get you friends and family to participate as well. That’s right: Each and every member of your household may file a slip! Let your family members become force multipliers for the cause of freedom. Make submitting witness slips something fun that everyone can share doing together. First, register an account at my.ilga.gov. You’ll need an email address and a password. Email accounts are free from gmail.com or a host of other providers. Go to my.ilga.gov and click on ‘register’. You’ll see the above screen. As soon as you enter your email and password, the ILGA people will almost instantly send you a confirmation email. Open that email and click the link to authenticate your account. And with this, you’ve done the hard part. If you struggle with this, get the kids or grandkids to help you. They’ll get you through this in nothing flat. Next, after verifying your email address, return to my.ilga.gov and login. The login button is in the upper right hand corner. Once you’ve logged in, click “update profile." Enter the usual information. At the bottom of the page, you will get three additional questions. For organization, put “not applicable” or "self" unless you serve in leadership for your club or organization. Firm/Business or Agency: For this one, again enter “self” or “myself” or some variation if you don’t have your own business. Lastly, “Representation:” Once again, enter “self” or “myself” unless you speak for a group or corporation. There is no need to misrepresent yourself. If you are not designated and authorized to represent a group in an official capacity, please do not say that you do. This goes double if you have a government job. Just because you work for the Secretary of State’s office doesn’t mean you speak for Jesse White or the Secretary of State's office. Also, just because you are a member of the National Rifle Association doesn’t mean that you represent the NRA. Finally, the last question in Section 4: Oral, Written statement, or Record of Appearance only. Unless you've made arrangements to speak, or submitted a written statement (that will likely never be read), select "Record of Appearance Only". But how will I know which bills to put in a slip for? Easy. We’ll tell you. (We’ll even give you links to click on to make it really easy!) And if you’ve logged into your account on the my.ilga.gov website, it will automatically fill out your personal information on the witness slips for you, saving you time and effort! We’ll also tell you to tag “Proponent”, “Opponent” or “No Position” on the bills. And unless you wish to provide oral testimony in person, click “Record of Appearance only”. Then click “submit”. Done. That was easy. Watch the Guns Save Life website (gunssavelife.com) for alerts or calls for witness slips once the fast-moving session gets started in earnest. While dozens or even scores of gun bills may be under consideration at any given time, we pick the ones where slips will make the most difference. For a complete list of bills, the people over at IllinoisCarry.com do a fantastic job detailing them exhaustively. They often have many more bills where you can submit witness slips if you have more spare time. If you’re already online, once you’re registered, it is only a matter of a few clicks to fill out the slip and submit it. Trust us, we’ll make it easy for you. This entry was posted on January 25, 2019 at 3:32 pm and is filed under GunNews. You can follow any responses to this entry through the RSS 2.0 feed. Thanks for the great instruction. I am ready to go when you inform of the Bill's to oppose. Just registered, ready to file. Thank you John for having these instructions on here and in ‘Gun News’. We’re going to need all the help we can get. If you don’t already have a log in, please take a few moments and start one now. All help is greatly appreciated. Put these on Facebook, it might help get more slips filed. I printed it. My concern is doing it wrong and my slip getting tossed. You can also send a polite email to ILSenate29@gmail.com to express opposition. I called Julie A. Morrison (individual who proposed SB 107 assault weapons ban) office to express my feeling and they said they are directing all voices to that email address. 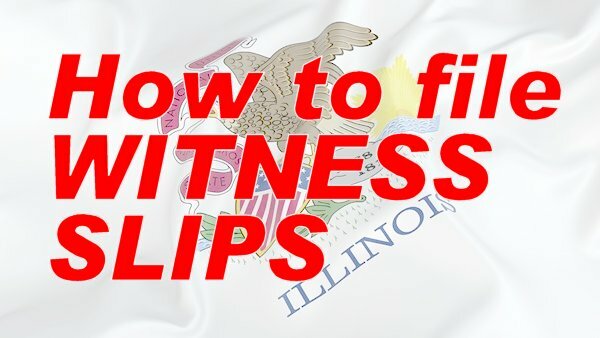 Are Witness Slips that come in from out-of-state addresses recorded or tabulated along with the Witness Slips filed by Illinois residents? peewee, a name and address are required information as a part of the Witness's profile in Identification Section 1.